Yoga can be practiced in a quiet forest or meadow. Or, as Nate Guadagni showed Sunday, it can be performed in a downtown square, even as people are bustling and live music is blaring. Gaudagni did not have to contend with any revving car engines, however, as his yoga demonstration was part of the city of Eugene’s Sunday Streets gathering, a no-cars-allowed extravaganza now in its sixth year. Several thousand people turned out on a sunny Sunday afternoon for an event that did allow some wheels — if they were of the bicycle, skateboard, rollerskate or wheelchair variety. The event provided a range of activities, all the way from Pearl Street and the Park Blocks to the east, to Monroe Park and Adams Street to the west. Attendees enjoyed demonstrations, dance parties, vendors and live music while rolling or walking the 11-block stretch of Broadway. 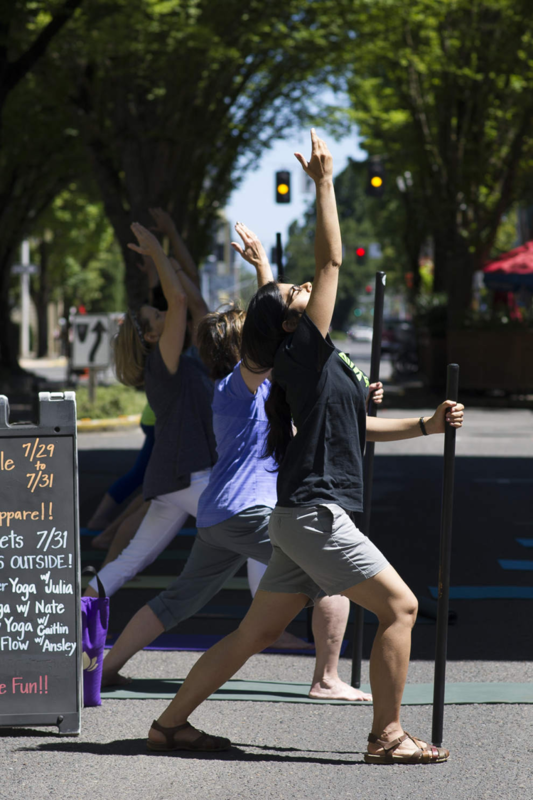 Guadagni, of Eugene Yoga, led a Bo Yoga class in the middle of Broadway between Pearl and Oak streets. Bo Yoga is a mixture of yoga, tai chi and meditation that involves using a flexible padded stick called a Bo Staff. As Guadagni led the class, some struggled to focus amid the live music echoing from the Park Blocks. But it didn’t seem to faze Hazel Jones from enjoying the free 45-minute class. “It’s such a great idea,” Jones said. Of course, it helped that the weather was “perfect,” she added.